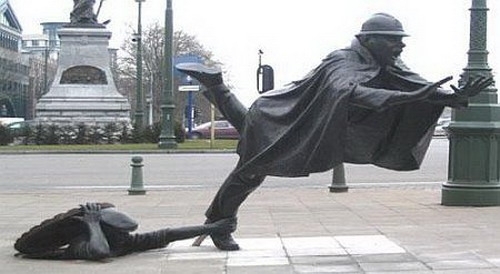 An incredible sculpture is a sign of Man’s genius and his ability to bring beauty to the world around him. They’re often true marvels of artistic vision and talent, and in many cases, some of them are even technological gifts from genuine creative geniuses. Then there’s these statues. The following images prove that beauty is absolutely in the eye of the beholder. Falling on your face on a crowded sidewalk in front of thousands of people is probably pretty high on people's list of to-don'ts, but don't worry, this guy already did it for you.